Brett Kavanaugh. Photo: Jim Bourg-Pool/Getty Images. 20 million people tuned in to at least part of the Kavanaugh hearings on TV Thursday, just slightly higher than the final number of Americans who watched the James Comey hearings on TV last year. 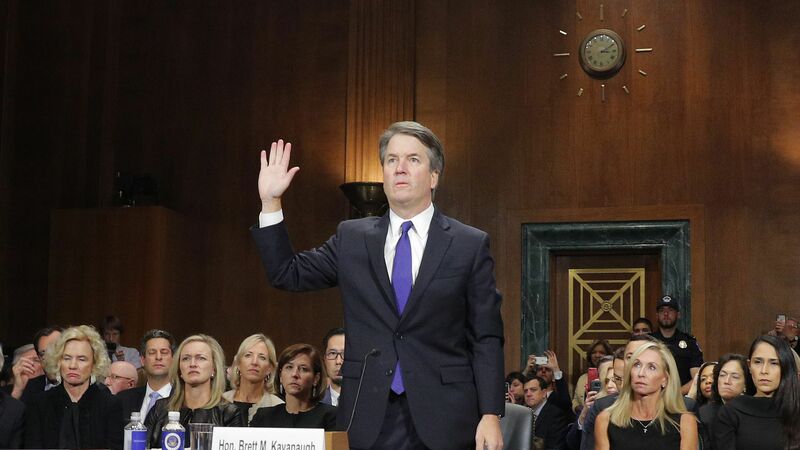 Why it matters: The drama has captured the attention of the nation because of its historic implications both for the makeup of the Supreme Court for the next several decades and for the momentum of the #MeToo movement. Yes but: These are preliminary ratings and they don't include digital viewership on social media or streaming sites. A final number will be released by Nielsen on Monday. By the numbers: According to Nielsen, the common coverage viewership number for the Kavanaugh/Ford Testimony yesterday among the six major broadcast and cable networks — ABC, CBS, NBC, FOX News, CNN and MSNBC — was 20.4 million. This doesn't include viewership data from other networks, so it is likely to be even higher. Millions of viewers also tuned into the hearings on digital platforms. For example, NBC says 6.8 million viewers livestreamed the hearings through NBC News digital platforms. CNN says it had its biggest day of 2018 for live streaming with 8.2 million live starts on its website and apps and more than 10 million when you include YouTube and Facebook. In cable, Fox News dominated hearing, beating its competitors by a landslide in total viewers and in the coveted 25-54 year-old demographic, which is what's most valuable to advertisers. Fox News had 5.7 million total viewers and 1.1 million in the coveted 25-54 demographic. MSNBC had 2.9 million viewers and 461,000 viewers in the coveted 25-54 demographic. CNN had 2.5 million total viewers and 736,000 viewers in the coveted 25-54 demographic. In broadcast, ABC had the most total viewers, but NBC had the most viewers in the 25-54 year-old demographic. NBC had 2.9 million total viewers and 749,000 viewers in the coveted 25-54 demographic. ABC had 3.2 million total viewers and 691,000 viewers in the coveted 25-54 demographic. CBS had 3.1 million total viewers and 632,000 viewers in the coveted 25-54 demographic.